George Andreadis (GRE) has been awarded the Beppe Croce Trophy, which honours an individual for their outstanding voluntary contribution to the sport of sailing. 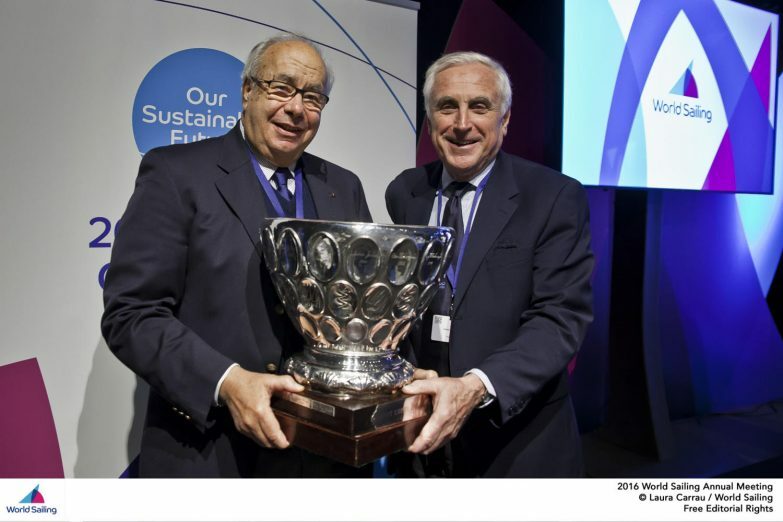 The trophy, which was first awarded in 1988 in memory of Beppe Croce, World Sailing President from 1969-1986, was presented to Andreadis by President Carlo Croce at the 2016 World Sailing Annual Conference in Barcelona, Spain. On receiving the award Andreadis said, “Your majesty, Mr President, ladies and gentleman this is a very touching moment. Receiving the Beppe Croce is the greatest honour and I would like to thank the board for bestowing me with the award. “2016 marks 44 years since I first attended the International Yacht Racing Union meeting in London in 1972. From the early 90’s the annual conference started travelling internationally and helped in embracing the success of far more of the sailing world which has been proven here in a record level of attendance. “Being involved as a committee member, and Chairman, on Council and as a Vice President, I am fully aware of and appreciate the diverse scope of World Sailing and the critical role it plays in developing sailing around the world. “I started sailing at a young age and became an Olympian at the 1968 Olympics in Mexico. Since then I have been involved in every Olympic Games from all aspects. I have also been fortunate to have raced around the world and in many different classes. My sailing career naturally led me in to sports administration and I look forward to seeing World Sailing evolve and thrive as much in the future as it has in over the past four decades. Born in Athens on 30 September 1941, Andreadis grew up in Greece and at a young age became a passionate and dedicated sailor. His passion led him to two appearances at the Olympic Games, in the Flying Dutchman at Mexico 1968 and Soling at Montreal 1976, and he has been continuously competing in international events over the past 40 years. Despite numerous national and international sailing titles to his credit, it is his work in the administration of the sport which has endeared Andreadis to the sailing community at large. Andreadis has been an active member of class associations and boards, entrusted with organizing major events that affirm the place of sailing in the Olympic Games. A founding member of the Hellenic Olympians Association, Andreadis helped shape the Olympic movement in his own country as well as making significant contributions to the Olympic competition at large. After competing in the Games, Andreadis became Team Leader of the Greek Sailing Team at Moscow 1980, was Chairman of the Measurement Committee for the next three editions and was Chairman of the Sailing Committee at Atlanta 1996. These, combined with his World Sailing duties at the Olympic Games led to Andreadis being awarded the Olympic Order of the International Olympic Committee (IOC) in 2010. Beginning his work with World Sailing in 1972, Andreadis has been eagerly involved in all aspects of sailing administration which has now culminated in his awarding of the Beppe Croce Trophy. Andreadis’ early involvement in the world governing body was based around the Keelboat Committee where he served as a member, then Vice Chair and eventually Chair. Present during the IRYU period, Andreadis served as Vice President between 1986-1994 and continued his involvement through the transition to ISAF, and on to World Sailing. A member of Council between 1994-1998 and 2008-2012 under the ISAF banner, Andreadis also served as Vice President twice more between 1998-2008 and 2012-2016 as well as sitting on the Offshore Committee (2000-2008). With a keen interest in the world of sport and sailing, Andreadis was integral in initiating disabled sailing in Greece and was a member of the Organizing Committee for the 2003 International Foundation of Disabled Sailing World Championship. He has also supported the Special Olympics as an Official Sponsor. Such is Andreadis’ passion for sailing, he created the Atalanti Racing Team in 1974. By promoting the values of sailing for over 40 years Andreadis has brought major sailing events to Greece. His recognition however extends past his native land as he has been an Honorary President of the Cyprus Yachting Association since 1995.